If you’ve decided to invest in your home, and you enjoy swimming, think about this. With less initial investment than a traditional swimming pool, but the same enjoyment and home improvement value, a swim spa makes sense. Here are three ways a swim spa is a smart investment. Multi-Function Lap Pool – The modern swim spa is a multi-function lap pool, with a relaxing spa at one end and a current for swimming at the other. Add resistance bands, an underwater treadmill and more for an aquatic exercise machine, lap pool and soothing spa in one. A Cost-Conscious Addition – When compared to the expense of a traditional in-ground swimming pool, even the best swim spa is conservatively priced. For families, a swim spa is an exciting investment that doesn’t take up the entire patio, yard or sunroom. Year Round Fitness and Fun – A swim spa offers year round access. Regardless of the weather, rain, snow or sun, swimming and aquatic exercise is possible. And, it can be placed outdoors or inside in an enclosed sunroom or patio. To learn more about the benefits of owning a swim spa, pick up a copy of our free buyer’s guide, Secrets to Swim Spa Buying Success. 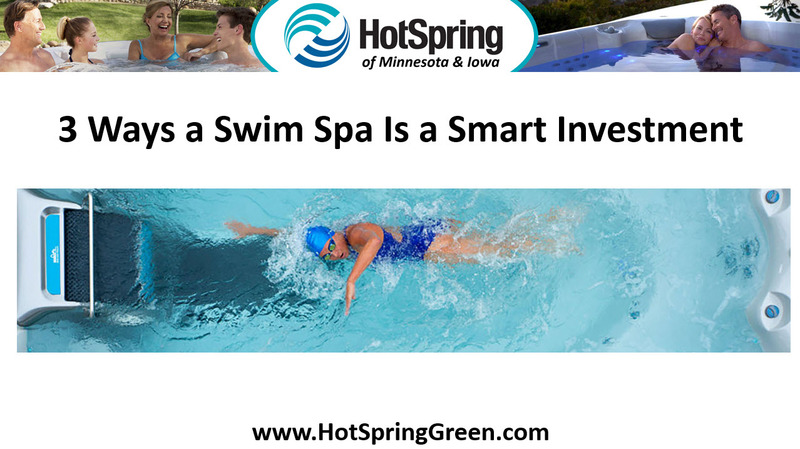 Just give us a call at ☎ 651-731-9745 or visit our website at: https://hotspringgreen.com/swim-spas.